Pinkeye, or conjunctivitis, is the most commonly treated eye infection and is extremely contagious. Pinkeye is easily treatable, so serious complications are rare, but it is important to be able to identify and prevent infections before they rapidly spread throughout an organization. More kids miss school because of pinkeye over any other medical reason. An estimated 3 million school days are missed annually due to conjunctivitis. Typical pinkeye infections last two to three days, but some severe cases can last several weeks. Pinkeye frequency is much greater in spring and summer due to the increase in pollen and allergies. 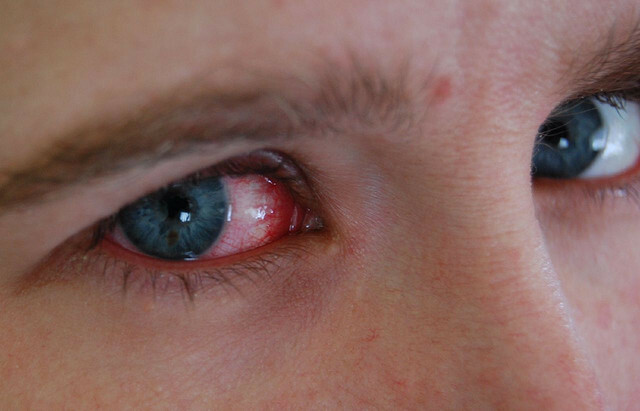 The following list of symptoms do not all need to be present for someone to have pinkeye, and even the presence of only one symptom can be indicative of a conjunctivitis infection. Itchy or burning sensation in the eyes. If you yourself have pinkeye, take a few days off of work and stay inside until the symptoms have disappeared. The best way to prevent outbreaks of pinkeye is to identify individuals who are infected and keep them away from others until they are no longer showing symptoms. This, however, can prove challenging in a number of instances. For example, what if a child is dropped off at your home or business with pinkeye? What do you do if the child’s parents are unable to pick them up and take them home right away? What if you are on a remote camping trip and someone else in the group contracts pinkeye? In instances like these, the best option is to try and keep the infected person away from others and watch them closely to make sure anyone or anything they come in contact with is sanitized properly. Hand Washing: In general, it’s good practice to routinely wash hands with warm water and soap. If none is available, use an alcohol-based hand sanitizer. If exposed to an individual known to have pinkeye, immediately wash your hands and avoid contact with anyone or anything else. Pack hand sanitizer any time you are away from hand washing stations, including: outdoor activities or overnight trips. Avoid Eye Touching: Because conjunctivitis causes eye irritation, it is a natural reaction to scratch them for relief. This, however, puts the disease on your hands making it easier to transfer. In addition, if you are not infected but someone you’ve come into contact with is, it’s best to avoid touching your eyes since you can give the infection to yourself this way. Avoid Unnecessary Contact: Objects like sheets, pillow cases, towels, eyeglasses, makeup and anything else that may come into contact with the eyes should not be shared. Avoid using or sharing these objects if you or someone else is known to be suffering from pinkeye. Avoid Swimming Pools: Do not use swimming pools if you are suffering from pinkeye. Not only will the chlorine in the pool irritate the condition and extend the healing time, but any towels or other common pool items used can easily transmit the disease to other swimmers. Sign Me Up! *Your privacy is important to us. We will never share or exploit your email address.